Read recent music news and feature articles below about Kimberlee. 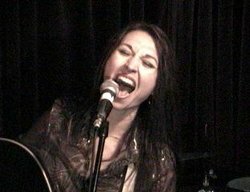 Come back soon to read more music news about Kimberlee and her soon to be released album "What am I gonna do?". Live music concerts by singer/songwriter and independent recording artist Kimberlee. R&B influenced folk rock that moves your soul. Original music and songs, CD reviews and music sales. Site Content copyright 1999 - 2003 KimberleeMusic. All rights reserved.